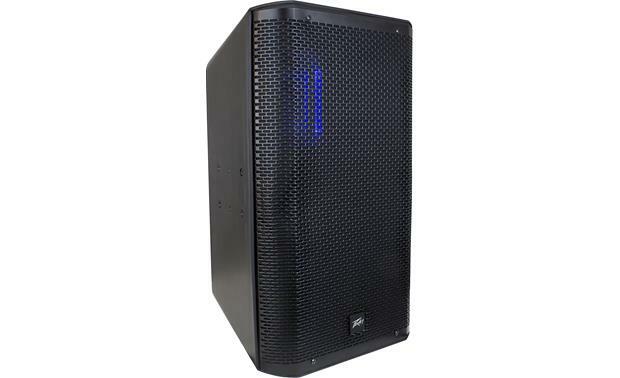 Peavey's RBN 112 loudspeaker comes packed with technology you'd expect in a high-end home stereo speaker, not in a PA speaker made to survive a tough life on the road. The RBN 112 features a lightweight ribbon tweeter that responds quicker than traditional dome tweeters, producing more accurate reproduction of percussive transients and high-frequency overtones, especially important for vocal intelligibility. The 12" woofer sports a powerful neodymium magnet and dual voice coils for extra-efficient handling of all the middle and lower frequencies. The onboard amplifiers can pump out a total of 1500 peak or 750 continuous watts, enough power to fill a small club or auditorium with loud rock music on its own. You can plug in a couple of microphones directly, so this speaker could serve as a complete, compact PA system, without needing a mixer. An LCD display and selector knob give you access to a number of control features designed to optimize the speaker's performance for different applications. 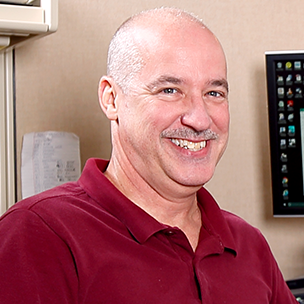 Program EQ presets match the speaker to the music genre being played as well as the speaker's physical position, onstage or on a pole, for example. A 9-band graphic EQ lets you customize the tone even further. Distortion Detection Technique (DDT™) circuitry lights up a warning LED on the front baffle when it first senses signal clipping. The LED glows bright and steady as the DDT limits the amplifiers' outputs to protect the drivers from damaging distortion. The LCD will display "DDT" when it engages. 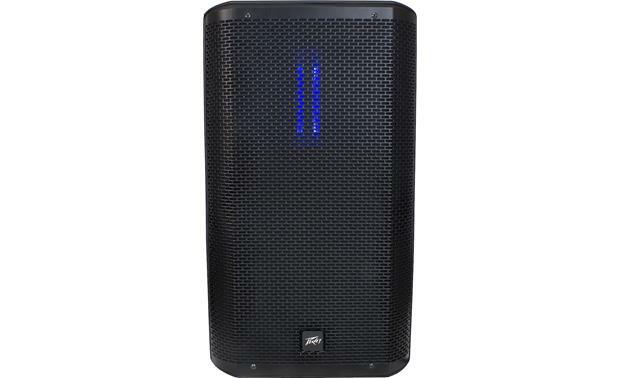 Peavey proudly spotlights their innovative and proprietary ribbon tweeter with some handsome blue outline lighting visible through the cloth-backed metal grille. You can turn the lights off if you want. 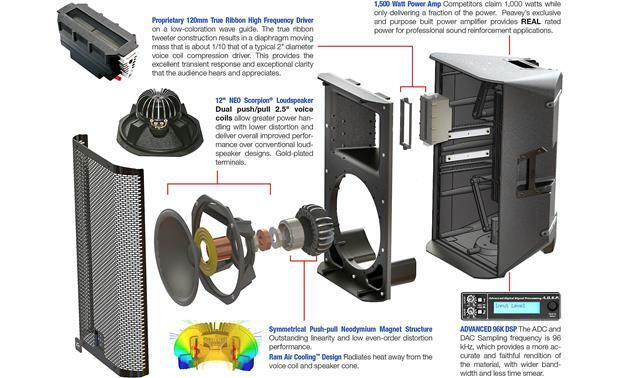 Overview: The Peavey RBN 112 powered loudspeaker offers superior quality audio and the power to deliver it at high volumes of up to 130 dB SPL. The 2-way speaker has separate amplifiers for the woofer and tweeter, with a total of 1500 watts of peak power. Dual independent inputs allow you to plug in microphones, CD player, or a portable music source. The injection-molded polypropylene enclosure has internal ribbing and bracing to handle everyday abuse. The enclosure is wedge-shaped, and can be placed upright or turned on its side. Full handles on the right side and top rear make it easy to transport. The speaker can also be pole-mounted or suspended. 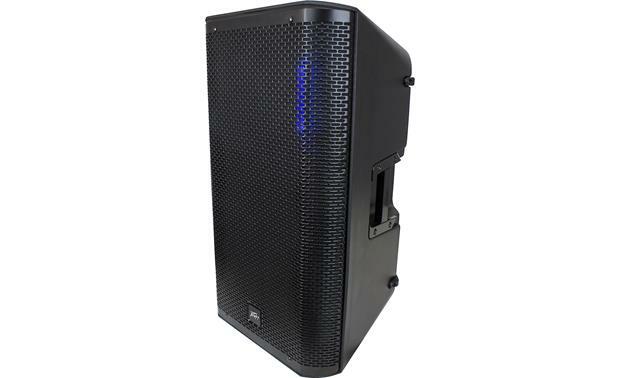 The RBN 112 is recommended for sound reinforcement, public address, karaoke, or musical playback. Drivers: The RBN 112 is equipped with a 12" Scorpion woofer with a Neodymium-based dual voice coil design. The symmetrical push-pull Neodymium magnet structure provides outstanding linearity and low distortion. In addition, the enclosure features Peavey's exclusive Ram Air Cooling system to pull heat away from the voice coil and speaker cone for greater reliability. 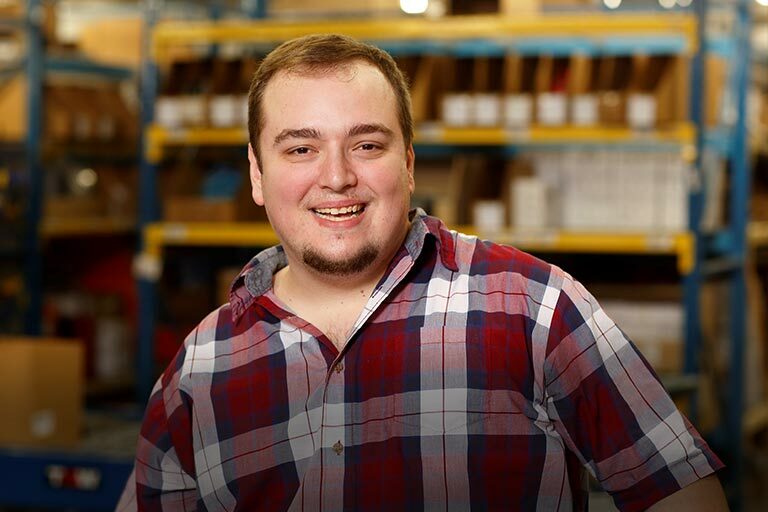 In the event of failure, the basket assembly can be replaced in the field, so you're up and running much quicker. The high frequency section features the proprietary 120mm RD 2.6 ribbon driver tweeter mounted on a low-coloration waveguide with a 110° (H) x 30° (V) coverage pattern. The ribbon tweeter has a diaphragm moving mass that is about 1/10 that of a typical 2" diameter voice coil compression driver. This results in excellent transient response and exceptional clarity. Amplifiers: The woofer and tweeter are driven by separate amplifiers, both with DDT compression to prevent clipping. The woofer amplifier features 500 watts continuous power/1000 watts peak power, while the tweeter amp delivers 250 watts continuous/500 watts peak. The amplifiers are fan cooled. A blue ribbon lens near the ribbon tweeter illuminates blue to indicate the power is on. Inputs/Outputs: The RBN 112 has two input channels, each with combo XLR and 1/4" TRS connectors, and independent rotary gain controls and Mic/Line switches. Channel 2 also has a 3.5mm input jack for connecting a portable device. There are two male XLR outputs: Direct Thru and Subwoofer Processed. The Direct Thru output is for linking multiple RBN 112s together or to feed a powered subwoofer or other electronics that can receive a full-range version of the input signal. A DIR/MIX switch on the output lets you switch between the Channel 1 input (DIR) or a mix of Channels 1 and 2 (MIX). The Subwoofer Processed output provides a filtered signal for use with a powered subwoofer speaker other than the Peavey RBN 215 or 118. DSP Menu: On the back of the speaker is a backlit, 2-line LCD with a rotary push-to-select button for accessing the user control menu. The 96kHz DSP processing control includes a 9-band graphic equalizer (63Hz to 16kHz), selectable output polarity, Bass Enhancement, and 0 to 150ms signal delay. You can choose from several Program EQ presets, including EDM, Voice, Rock, DJ, and Custom (if GEQ has been adjusted). The DSP menu also lets you select the speaker's location (Pole Mount, Flown, or Floor Monitor) which changes the signal processing to account for boundary surfaces. When not making DSP adjustments, the display shows an input level meter. Floor Placement: The speaker has three sturdy rubber feet on the bottom (including a 4.5" rear foot) for floor standing use. 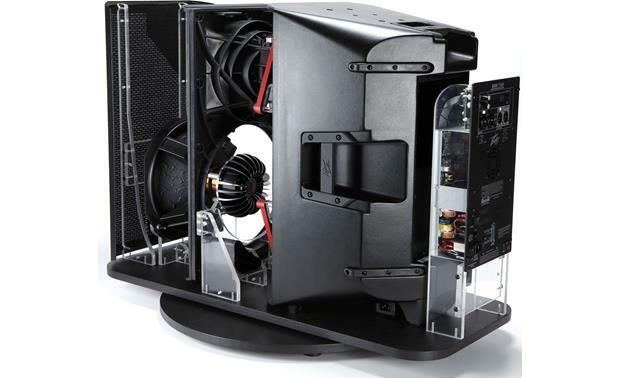 You can also lay the enclosure on its side as an angled floor monitor. Pole Mount: A stand mount cup is molded into the bottom of the speaker so that it can be mounted on a standard 36mm (1-3/8") diameter stand pole. Suspension: The speaker can be suspended via cables, and angled up to 30°. Mounting points for eyebolts (M6 metric thread, 1.0 mm per thread) are provided at several places on the enclosure. Proper hardware and extreme caution should be used when "flying" the speaker. Optional Brackets: The mounting inserts are designed to be used in groups of four with the optional Peavey VM70, and the Peavey Impulse 12" Array Bracket. 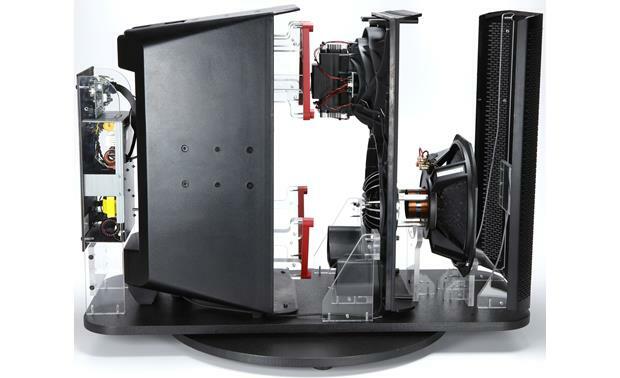 In addition, the Peavey Wall-Mount Speaker Stand can be used with the speaker, and is designed to fit into the stand mount cup on the bottom of the cabinet. Tweeter: 250 watts (continuous, <1% distortion), 500 watts (peak) into 8Ω. 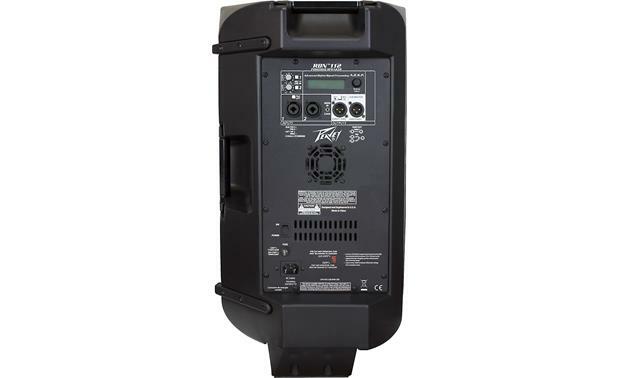 Searches related to the Peavey RBN™ 112 12" 2-way powered PA speaker — 1,500W peak.